Get ready for a back-building education from IFBB physique pro Craig Capurso! Use these 18 insider tips to build a back that's not just wide, but XXL thick. When you're buying a house, what's between the four walls is critical: the integrity of the building, the design, the functionality, and—of course—an open floor plan. But you'd be remiss to make such a large real-estate decision without inspecting the yard and local neighborhood, because those factor into the equation as well. To build a similar strong, thick, and wide back, you have to take a wide-angle approach and work all the associated muscles. It's not too farfetched to say that buying a house is like training your back. You can't be solely concerned with the latissimus dorsi—the largest muscle of the back—because there are plenty of neighbors that must be accounted for: the rhomboids, middle and lower traps, teres major, rear delts, spinal erectors, and more. When you're training this muscle group, you're covering a lot of real estate. That means you need to invest in maximizing the size of all the smaller muscles, too. This smart training investment is made clear when you see a well-developed bodybuilder whose back is like a three-dimensional topographical map, complete with bumps and ridges that suggest origin and insertion points of a number of different muscles. To build a similar strong, thick, and wide back, you have to take a wide-angle approach and work all the associated muscles. Bodybuilding.com sought the advice of one of our most popular trainers, Cellucor-sponsored athlete Craig Capurso, for advice on super-sizing the many muscles that form a well-developed back. Capurso helped us come up with these 18 suggestions; if you've got any more, please add them to the comments section at the bottom of the article. 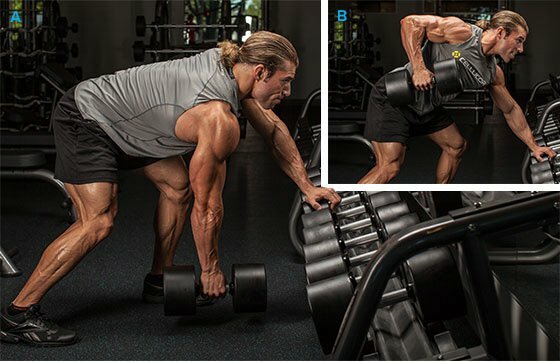 "In my opinion, the one-arm dumbbell row is the best back exercise," says Craig. "I do the move off the dumbbell rack in order to really pull heavy weight. Unlike with a barbell, when using a single dumbbell, you're able to fully extend your arm to get a deeper stretch and even pull it up further, therefore activating more muscle fibers. This is how I have developed my back over the years. "If you use strict form all the time, you'll lose the benefits of a minor cheat—in the form of a slight dip and pull—that's effective for adding poundage and hitting the muscles beyond their limits. While I change my workouts and switch the order of my exercises routinely, for most lifters this is an excellent second exercise in your workout after you're warmed up." Many people think that hand position determines what aspect of the back gets worked, but that's not exactly right—it's elbow position. "Your elbow determines the muscles that get activated when retracting for a squeeze," says Craig. "If your elbows are traveling back way out to your sides at shoulder height, then you're focusing on the upper muscles of the back and traps. On the other hand, if your elbow is low and pinned next to your body, then you're targeting the muscles of the mid back and lats." In general, movements in which you take a wide grip are the ones that cause your elbows to stay out wide, and they're best for upper lats and middle traps, rear delts, and rhomboids. Conversely, when using a close or reverse grip, the elbows stay tighter to your sides, and therefore better target the lower area of the lats. Widening your V-taper—your upper lats—requires that you widen your grip. "Wide-grip pull-ups are one of the best ways to target the upper lats," says Craig. "You're fully stretching the fascia [the outermost sheath that covers and shapes the muscle tissue] and contracting at the top, and then bringing yourself down in two ways: forceful with lots of weight, or slowly with a pause at the end. Both have their place and should be interchanged regularly." Lifters often talk about not only building up their V-taper, but also their middle-back thickness, which is more visible when you're standing sideways. The biggest muscle you see here is the middle and lower portion of the trapezius. Wide-grip exercises in which you pull into your midsection are best for the middle traps. Wide-grip seated cable rows and T-bar rows are very effective here. To emphasize the lower portion of the traps, movements in which you pull from a near-overhead direction are the best choices, like wide-grip pull-downs. Including a variety of movements with alternating hand positions is one way to effectively ensure you hit muscles from a number of angles. "Machines are going to limit your range of motion, but they allow you the time to focus on a static pause," says Craig. "I find it much more difficult to pause when using free weights on most back exercises. For one, I'm dealing with loads that are simply too heavy for a distinct pause. I do focus on the negative a bit more with free-weight moves to make up for that [lack of a] concentrated contraction." There are any number of back exercises to choose from, but when putting together exercises for your workout, try to include a variety of movements that require different grips and angles of pull relative to your torso. Bent-over rows, standing machine rows, and T-bar rows pull at the same basic angle relative to your body, so consider doing one with an overhand grip and another with a closer or reverse grip. The same "change your grip" strategy goes for seated cable rows and machine rows. Opt for a long lat bar and do a wide, overhand grip with the seated cable movement if you're going to use a close grip on a machine. Going from full extension to peak contraction is necessary not only to train your lats, but any other muscle group in the body. When you use a weight that's too heavy, however, it's nearly impossible to achieve that full range of motion. When pulling, bring your elbows as far back behind the plane of your body as possible. Going from full extension to peak contraction is necessary not only to train your lats, but any other muscle group in the body. Consciously squeeze your shoulder blades together, then allow the weight to pull your arms back to full extension while trying not to significantly bend forward at the waist. "There are no real secrets to back training," advises Craig, "but one rule is critical: You should always finish your workout. If you're healthy, you should be pushing your workouts to the max, leaving it all in the gym and feeling completely exhausted. You know what a killer leg day feels like: You may fall down the stairs when you leave the gym. On back day, it's when turning the steering wheel of your car becomes a difficult task." A little cheating is common on just about any exercise, but with back exercises, you have to be particularly careful with your spine. The real danger is rounding your spine with heavy loads, which puts a great deal of pressure of the discs of your lumbar. Besides learning how to hold your natural curvature when doing back exercises—especially bent-over rows—you should also eliminate the forward and back "rocking motion" all too common when doing pull-downs, seated cable rows, and bent-over rows. In small doses, bringing the lower back into a movement intended for the upper lats is an effective use of cheating, but significant rocking means that your lower back is doing most of the work—and the target muscle is not. 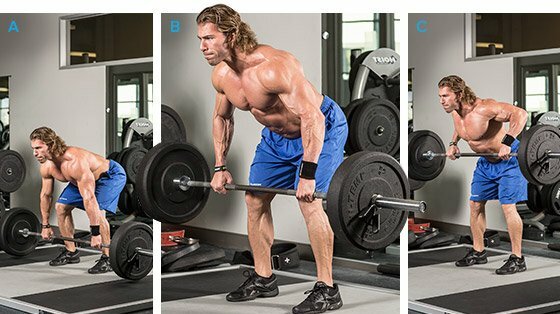 "The deadlift-to-row is one of the most intense exercises you'll ever perform—period," says Craig. "You perform the bottom motion of a deadlift, but once you pass the knees, you pull the bar into your gut like you would a bent-over barbell row. This exercise will leave you gasping for air, but is well worth it at the end." Combining these two monster movements in one not only builds muscle, but makes for a more efficient workout. Nearly every rowing motion actively recruits the rear delts, so training them with back seems like a no-brainer. Craig's take: "I do [rear delts] both on back and shoulder day, but I keep the weight very light. I consider them an auxiliary muscle that gets much less attention during the back session, say about 20 percent. I follow this dual approach because they're getting hit on both of these training days, so you don't need to overdo them, but you do need to sculpt them with some dedicated rear-delt moves." "One underrated back exercise every lifter should do is the bodyweight pull-up," says Craig. "I say this in part because I don't do them enough, and I've noticed that I should be able to do a helluva lot more of them based on what I can wrap and pull from a pull-down perspective. Pull-ups provide great shape, and this one exercise hits many muscles of the back. It has the potential for variation, with dead hang and pull, static pause, weighted, and slow negatives." "One underrated back exercise every lifter should do is the bodyweight pull-up." says Craig. Multijoint exercises make up the bulk of mass-building exercises on back day, but you can finish off with a single-joint exercise to help flush the muscle at the end of your workout. The most common choice is the straight-arm pull-down, but a close free-weight cousin is the dumbbell pullover done on a decline bench. In both movements, the emphasis on the lower lats is greatest when your hands approach your thighs. Hold the final rep for a count of five, a peak contraction that will intensify burn. "My lower back fatigues as I make my way through my back workouts, especially with movements that are performed bent over," says Craig. "If I were to train lower back at the beginning of a workout, I'd probably not be able to stand upright to finish the remainder of the sets. It's a nagging, burning sensation that'll cause you lots of discomfort when you overdo it, so it's best to train the lower-back muscles after you've done all your other back work." "While there aren't many single-joint movements for your lower back, I do include reverse back extensions," says Craig. "To perform them, I lay face-down on a bench, allowing my lower torso to hang over the side. Keeping my upper body stabilized, I raise and lower my legs. Most people opt for the lower-back extension, in which your feet are locked and your upper body does the extension, but that's very similar to what you may experience throughout your day. I like adding exercises that are not typically performed, making my time at the gym more valuable." Many bodybuilders eschew lifting straps because they fear they'll reduce forearm and grip strength over time. That's a poor reason not to use straps; your grip will often give out before your lats do, and that can cost you a couple extra reps. Using straps on your heaviest sets equates to superior lat growth because of the extra work. As for grip and forearm training, we're all for it; just do it on a dedicated day rather than expect your back workout to carry the load. "Because the back is such a large area and includes a number of muscle groups, exercise selection is especially important," says Craig. "If it's a weak point, consider hitting the muscle group more frequently than just once during your training cycle. Just make sure you give it at least 48 hours before training it again, and that includes the biceps." If you follow a twice-a-split training strategy, make sure the workouts are very different from each other. Follow different rep progressions like pyramids one day and reverse the next, and vary exercise selection to work on weak areas. "Ensure you eat all your meals beforehand, and make sure that you have a goal and plan before you get to the gym," offers Craig. "When the going gets tough, most people drop out. If you have your session on paper, you'll feel more obligated to finish the workout as planned."